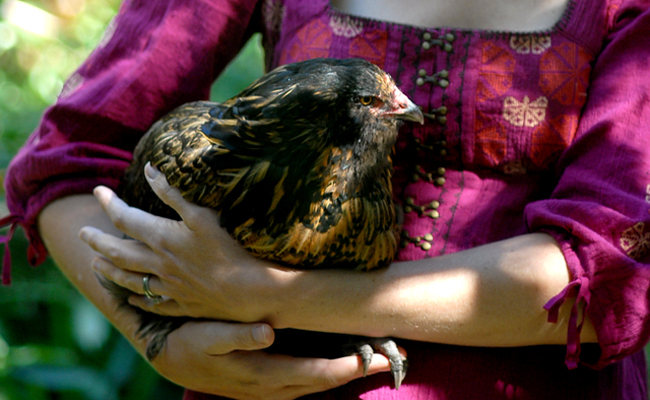 Martha Lazar holds her hen, Lulu, in her Carroll Gardens backyard farm. I run into Martha Lazar on Court Street. She’s frazzled. Last night, her favorite chicken, Edie, died. 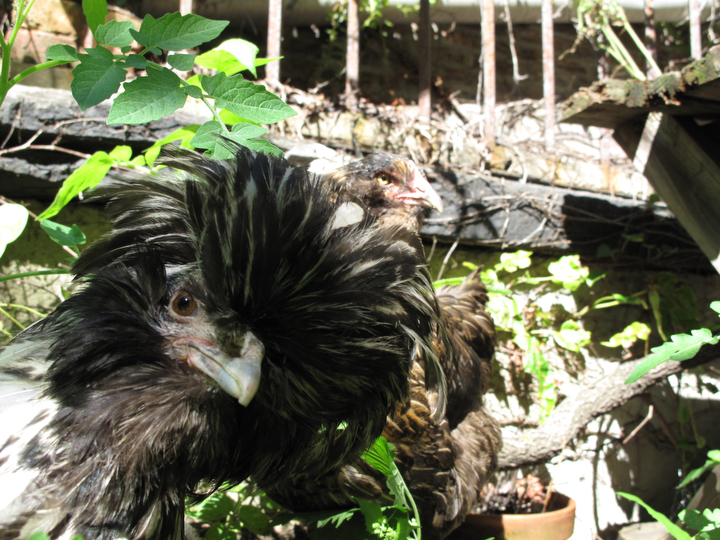 For more than two years the orange-and-brown chicken laid grey-blue eggs at Martha’s Carroll Gardens backyard mini farm, on Butler Street. The hen was her pet. It’s not the worst Martha’s had to deal with. A year ago, Edie got sick and stopped laying eggs. Martha had a heck of a time finding a veterinarian who would see the chicken. She finally ended up buying an anatomy book, donning gloves and becoming her own poultry gynecologist: Martha reached inside Edie and pulled out a lodged egg. “It was disgusting,” Martha says. When Martha decided to set up a chicken coop three years ago, she was the only person she knew to keep chickens in South Brooklyn. Now she’s an elder member of a chicken-farming community, with hens clucking in Red Hook, Cobble Hill, Carroll Gardens, the Gowanus area and elsewhere. Turns out hens are legal to keep in New York City; roosters, however, are not. In an area where many apartments feature sizeable back yards, there is room for coops. Considering the growing passion in Brooklyn for the “locavore” food movement – in which folks attempt to purchase food that’s been grown and produced locally using small-time farming traditions – well, what could be more local than gathering organic eggs from your backyard? I visit on a late summer day, before Edie’s passing, to check out Martha’s urban ag project. Clucking around out back is Martha’s trio of chickens, viewable from the kitchen through a large picture window. Andie is the funny chicken in the group. 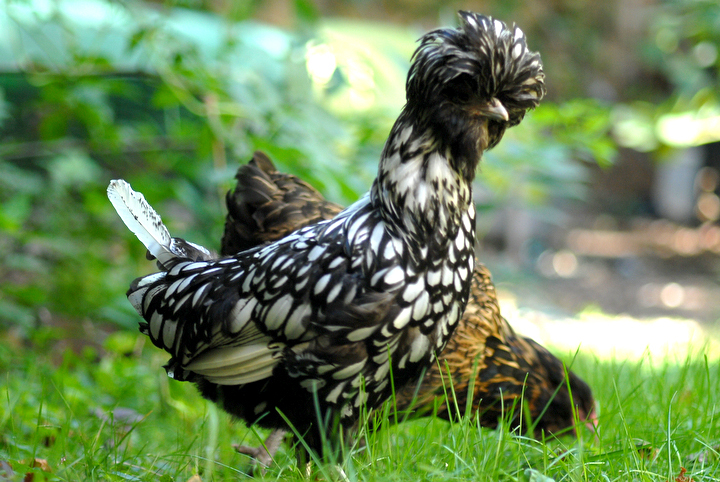 A silver-laced Polish hen with a crazy mop of hair, Andie sports black feathers laced with white. The hair makes it hard for Andy to see, so she sometimes walks into things. There’s Edie, a lovely bird, a gentle spirit, and rounding out the trio is Lulu, named after Lou Reed. She lays dark sage green eggs. These are “Easter eggers,” because they lay colored eggs. “I know who’s laid an egg from the color,” Martha says. The birds lay as many as five eggs a week, each, despite their age: two years. Most commercially-raised chickens are slaughtered after a year as their egg production slows, Martha says. Commercial chickens, called Leghorns, are white and have been bred to crank out eggs. But this project is about many things for Martha. “I’m into the homesteading thing,” Martha says. She’s making Kim chi and kombucha in her kitchen, and recently made some sauerkraut. She’s also got a bit of a menagerie, with eight fish and a cat. Lindsay, Martha’s first-grader, collects the eggs. “I like her to have a connection with food and where it comes from,” Martha says. We survey the coop. “It’s palatial for three chickens,” Martha says. Her pen is 10 feet by 10 feet; the yard is 25 feet by 40 feet. The birds often roam in the grass, devouring slugs, green veggies and mosquitoes. Yesterday, the “girls,” as Martha calls them, feasted on over-ripe strawberries. Everything about this chicken farm is delivered-to-your-doorstep, which seems perfectly Brooklyn. Martha’s chickens came overnight mail via U.S. Postal Service, from mypetchicken.com; a day old, in a box, carefully wrapped in a nest of green nutritious goo and bedding. They can live for three days in the box, Martha says. “They came happy and healthy,” Martha says. The coop, too, was ordered online from a British company. The coop is called an Eglu. It looks like a very small green igloo. The chickens sleep in the Eglu, defecate profusely and lay eggs there. To clean the coop, you slide out a sheet that catches the stuff, and Martha dumps it into her composter. Along with coffee grounds and scraps from the kitchen and yard, the chicken waste helps produce a great organic fertilizer. Martha uses the rich stuff for her small farm, which produces tomatoes, blueberries, currants, elderberries, apples and gooseberries, bok choy, lettuce, kale and tiny purple carrots. My friend from China tells me that back home, many people kept chickens in the backyard, and that they were messy and very smelly. According to Martha, newfangled coops take a lot of the mess away. It’s important when setting up a coop to make sure it can be cleaned easily, she says. Still, keeping chickens isn’t for everyone. 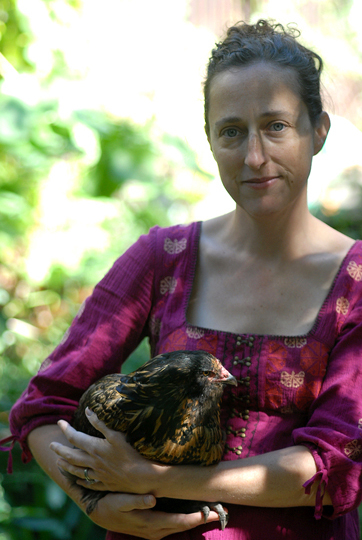 For Martha, the inspiration for keeping backyard chickens came when she read Animal, Vegetable, Miracle, by Barbara Kingsolver, in which the author grows her family’s food for a year, and The Omnivore’s Dilemma, by Michael Pollan, in which the author investigates where his dinner comes from. It’s been fairly well documented that backyard chicken farming is a national sensation. There’s even a Backyard Poultry Magazine, with 50,000 subscribers. But there is heartbreak with keeping these animals as pets. Sadly, Edie, has passed. Who’s to say if it was the illnesses she’s had, with the lodged egg and all, or if it was related to a more sinister event months ago. On that night, as it was getting dark, Martha heard some commotion. She and her husband, Neil, went out into the yard. A raccoon had scaled the wall lining the yard and taken a swipe at Edie. She was bleeding. Martha and Neil yelled at the raccoon and tried to scare him away. I talk to Declan Walsh on the phone in late October. He’s driving home to Red Hook from his office at John Jay College of Criminal Justice in Manhattan, and he’s hopping mad. The night before, a raccoon broke into his coop, which Declan has been working on for weeks to fortify against raccoons. “One of my chickens was killed last night. I wasn’t done fortifying my coop, and of course the f*%&-er came in and ate one of my chickens. I walked into the coop and there were feathers everywhere. It’s my fault, because I didn’t finish it completely. It’s a family of raccoons. They took her back to wherever they live. They had a nice chicken dinner. “I’m at war with the raccoons,” Declan says. “That’s life on the farm,” he adds. Declan and his wife, Maria, operate the Red Hook Poultry Association. Last year they had 75 chickens: 50 “broilers,” or birds raised for meat, and 25 “layers.” Walsh and his wife help locals set up coops and sometimes provide chickens. They sell eggs if they’ve got a surplus. Declan says that for years, people have trapped nuisance raccoon and released them in Red Hook, thinking it was open territory. Declan started keeping chickens eight years ago after a stay in the Amish country at a bed and breakfast. “We ended up driving home from Lancaster County with four Rhode Island reds in the car,” Declan says. Declan and his chickens have been featured a dozen times in all sorts of media stories, including an appearance on The Today Show. “It was hilarious. We drove up in a 1976 El Camino with a car full of chickens and parked right in Rockefeller Center,” Declan said. 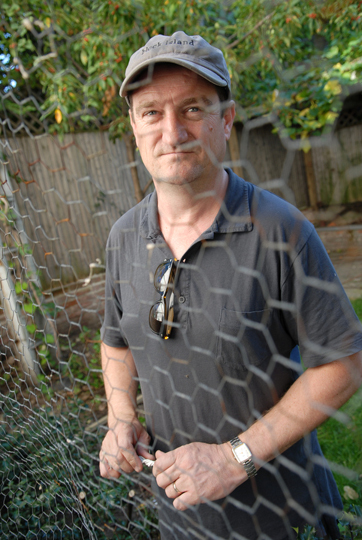 During last year’s experiment, when Declan and Maria raised 50 meat birds, he became alarmed about common poultry. “What we eat as chicken is bizarre. It’s crazy how we cultivate our protein,” Declan says. Declan’s “broilers” were the same chickens used in commercial operations, he says. He wanted to see what they were like. It was not pretty: the birds ate constantly and had no interest in walking around. They became morbidly obese rapidly. “They’ve bred animals that can convert feed to fat quickly. We’ve selectively bred the animals to be obese,” Declan says. The life span of a broiler 20 years ago was 80 days. Now, it’s 45 days, he says. Is he sad when the chickens die? “I don’t have a pet relation with the chickens,” Declan says. “We view them as livestock. “I’ve done slaughter in the backyard myself. We were thinking of doing a workshop: How to slaughter a chicken. If you are interested in where your food comes from, that’s part of it. In New York, everyone wants a workshop before they do anything. Most of the world, there’s no workshop. If you need to kill a chicken, you kill the chicken. Read Martha’s very entertaining blog, including an account of a recent raccoon attack and other tales. To order baby chickens, go to mypetchicken.com. Please help me with this as my wife and I have been struggling to find a good/reliable site to obtain Chicken Coop designs. I just read your story about chickens in Brooklyn. I live in Florida and my daughter lives in your neighborhood. She sent me the article and I enjoyed it. More and more, I hear of people growing their own food, keeping chickens, etc. The more I hear of it, the better I like it. Enjoy.